This Freedom board is based on the KE04Z8VFK4 which is a 48MHz device from the 5V robust KE family with Cortex-M0+ core. This KE04 device has 8k Flash and 1k SRAM and is in a 24 pin QFP package, whereby the KE04 is also available in 16 pin TSSOP, 20 pin SIC, 44, 64 and 80 pin LQFP, 64 pin QFP and its memory ranges from 18k .. 128k Flash and 1k .. 16k SRAM. There is an 8MHz crystal on the board for clocking the part. µTasker operating system operation with UART on the OpenSDA VCOM interface at 115200 Baud. Green LED toggles at 2.5Hz, red LED is controlled by a periodic 100ms Flex Timer 2 interrupt and the blue LED is driven by Flex Timer 0 (channel 1) driving a 1kHz 20% PWM output [6.69k]. When the board resets it display the reset cause and some information about the OS memory utilisation. Each time the enter key is pressed the heap and stack utilisation display is updated. Due to the small amount of memory in this device a continuous monitor of the memory situation is of great importance in all utilisations! 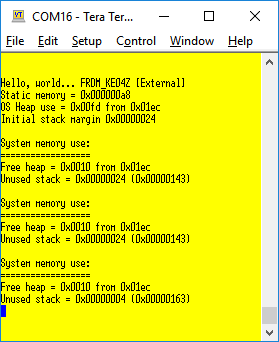 This is a standalone software that can be loaded using the FRDM-KE04Z's USB-MSD boot loader.